We had a rather cold beginning of the year, but the weather is finally beginning to gt spring-ish. With Golden Week approachng, hope is that there will be warm and sunny days so we can cycle around ! Last weekend, some of Cycle Tokyo! members went out riding along the Tone River located north of Tokyo, started from Kurihashi and headed for Takasaki City, Gunma Prefecture. A one way ride just around 90Km total, was a very smooth one thanks to light follow wind. 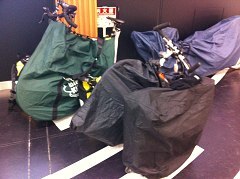 We packed our bikes and took them on the train to Kurihashi, and on the way back home from Takasaki. A continuous carpet of very bright yellow Cole Flower (Celery cabbage) spreads along the cycling road, in full bloom just about now. 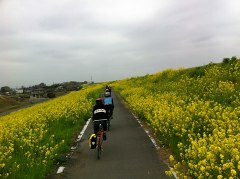 April to May is a very good time to cycle here in the Kanto area. This page contains a single entry from the blog posted on April 23, 2012 9:14 PM. The previous post in this blog was Bike Ride 14-Jan-2012 (and Happy New Year !). The next post in this blog is Annular Solar Eclipse.